Thank Your Lucky Stars has got everything. It's got Eddie Cantor's ceaseless mugging and Dinah Shore's honey-dipped voice. Dennis Morgan's Irish tenor and S. Z. Sakall's saggy jowls. Errol Flynn doing a sea shanty and John Garfield attempting to croon. Joan Leslie pouring on the sweetness and Ann Sheridan oomphing it up. Newly arrived on sparkling Blu Ray from Warner's Archive Collection, this overstuffed 1943 musical-comedy practically grabs you by the collar and screams "Love me!" until the viewer has no other choice but to cry "Uncle!" 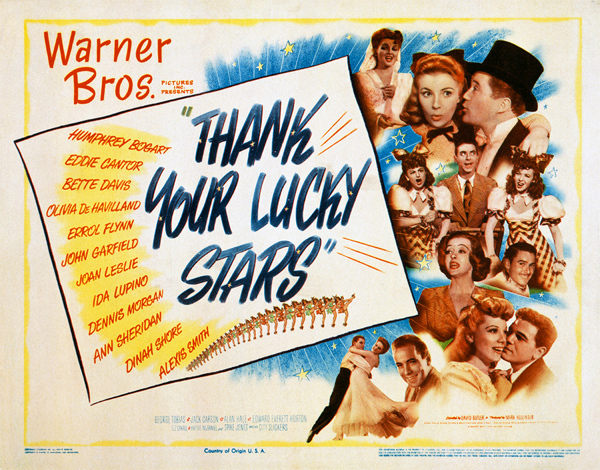 As Warner Bros. studio's second attempt (after This Is The Army) at doing a lavish star-studded musical-comedy as a thank-you to America's World War II servicemen, Thank Your Lucky Stars makes for an overbearing, eager-to-please date. This is mainly due to two factors: Eddie Cantor, and Eddie Cantor. The pie-eyed, aging yet still zestful comedy star gets top billing here in two roles - as himself, a narcissistic radio star, and as Joe Simpson, a meek tour bus driver and aspiring actor attempting to break into the Hollywood showbiz scene. Perhaps Cantor's one-note shtick is the reason I've managed to avoid this movie all these years, but the fact that the fizzy plot often pokes fun at Cantor's old-fashioned, corny image makes it more fun than it ought to be. At the age of fifty, Cantor has the sheer chutzpah to pull off this physically demanding double act - including some then-sophisticated special effects when the two characters are onscreen together. 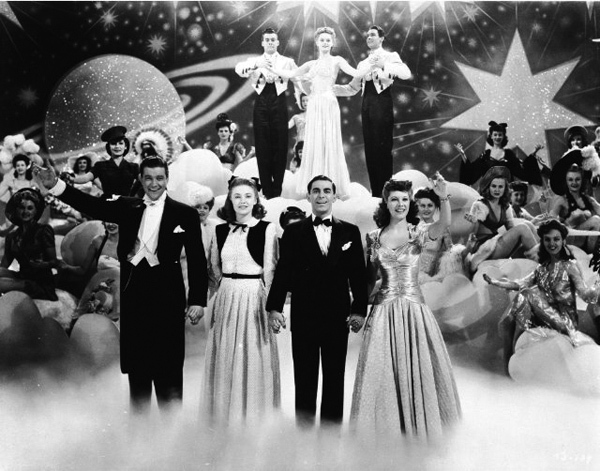 Thank Your Lucky Stars' plot goes along with typical musical revue conventions as a slight framework for the musical numbers, many of which showcase the dramatic heavy hitters from Warner Bros.' acting stable singing, dancing, and doing pratfalls. Edward Everett Horton and S. Z. "Cuddles" Sakall play producers mounting a lavish stage benefit, a production that needs a popular singing star like Dinah Shore. Trouble is, Shore is contractually obligated to egomaniacal Cantor's radio program. Cantor agrees to lend Shore out on the condition that he gets to serve as chairman on the advisory board of Horton and Sakall's company, duties which eventually balloon to him running the entire show. While the benefit threatens to spin out of control, Cantor's lookalike, Joe Simpson, gets roped into a scheme hatched by Pat Dixon (Joan Lesie), a perky songwriter, to get her handsome singing friend Tommy Randolph (Dennis Morgan) into the show. Against all odds, their switcheroo plan works - leaving Simpson trying to fill Cantor's egotistical shoes backstage, and the real Cantor on the run from a sadistic nurse (Ruth Donnelly). You didn't come around here seeking gritty realism, did you? Admittedly, there are times when Thank Your Lucky Stars threatens to implode from its own silliness, but it moves along pleasantly enough with lots of snappy lines from screenwriters James V. Kern, Norman Panama and Melvin Frank (the latter two responsible for White Christmas, Mr. Blandings Builds His Dream House and so many other memorable comedies). Luckily, the movie is structured in a way that, as soon as Cantor's brash shenanigans get to be too much, a lushly-produced musical number appears. True, the music tends to be pleasantly forgettable (with one notable exception), as epitomized by all three of Dinah Shore's sweetly sung, elaborately staged love songs. Director David Butler (Calamity Jane) apparently knew how to move things along at a brisk pace, though, making this film's two hour-plus running time breeze by effortlessly. For vintage movie buffs, it's a real treat to see the Thank Your Lucky Stars cameos from Warner's non-musical stars, letting their hair down. Whether it's Humphrey Bogart spoofing his tough-guy image or Ann Sheridan vamping it up with a troupe of nightgown-bedecked beauties, there's a lot of stuff to enjoy here. Hattie McDaniel, Willie Best and an all-African-American cast contribute to the jazzy "Ice Cold Katie," while Bette Davis wryly talk-sings her way through "They're Either Too Young Or Too Old," among a handful of tunes that directly deal with War-era concerns (with the most eligible guys off fighting, Davis can't find a suitable date). Morgan croons and Alexis Smith tango-dances through another number vaguely referring to F.D.R. 's "Good Neighbor" policy with Latin America, while Cantor leads the rest of this star-studded ensemble in a kitschy, glitzy, heaven-themed finale. While I didn't have the earlier DVD on hand to compare, Warner Archives' made-on-demand edition of Thank Your Lucky Stars comes to Blu Ray looking neat as a pin. The pillarboxed 1.37:1 image appears to have gotten a comprehensive restoration - clean, sharp, basically free of spots, dirt, scratches and other flaws. While the film's black and white cinematography is pretty typical of Warner Bros. productions from that time, the high-def transfer brings out some nice details that one wouldn't normally notice on the DVD. The lossless 2.0 mono soundtrack also sounds pretty spiffy. While the soundtrack gets more hissy and distorted during musical numbers, it ends up sounding clear and pleasant despite the limitations of the period. Optional English SDH subtitles are provided, as well. Musical shorts Three Cheers for the Girls and The United States Army Band. While Army Band is a straightforward affair with the ensemble playing a patriotic medley in an outdoor stadium, Three Cheers recycles several older Busby Berkeley numbers with musical introduction by a dressing roomful of very 1943 chorus girls. An educational short produced by Warner Bros. for the U.S. government, Food and Magic has Jack Carson explaining the details of food rationing through magic tricks and filmic special effects. In high-definition. Two 1943 Bugs Bunny cartoons, Fallen Hare and Little Red Riding Rabbit, are presented here in high-definition. Peak-era Looney Tunes, of course, with Bugs up against a cunning gremlin dismantling a WWII aircraft and a bratty Little Red Riding Hood (voiced by Bea Benedaret). Hollywood Canteen Celebrates First Birthday is a few minutes of silent newsreel footage of the famous military-personnel-only nightclub run by Hollywood stars during the war. 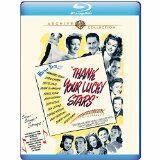 A Lady Esther Screen Guild Theater radio version of Thank Your Lucky Stars is also included. This September 27, 1943 broadcast had Cantor, Shore and Morgan in a casual, gag- and song-filled half-hour highlights program. Trailers for Thank Your Lucky Stars and Warners' patriotic drama Watch on the Rhine are also included. A quick-paced, unapologetically goofy part of Warner Brothers' cycle of star-filled World War II musical morale boosters, Thank Your Lucky Stars comes out swimmingly with a snappy script and several offbeat numbers (my fave: Bette Davis speak-singing "They're Either Too Young Or Too Old"). Warner Archives' lovely Blu Ray edition comes with a small army of supplements to complete that aggressively cheery, made-in-1943 feeling. Recommended.